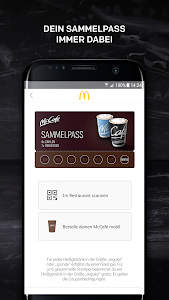 The official McDonald's Android app: your favorite products, all restaurants and coupons. • Coupons *** for direct redemption during the promotion period. Simply scan at checkout or kiosk and save. Not all McDonald's restaurants participate in all coupon promotions. 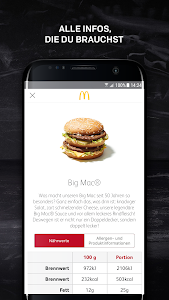 The app needs your location to show you the coupons you can redeem at restaurants near you. 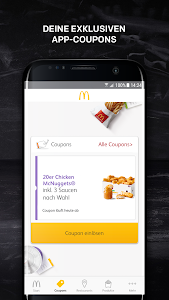 In addition to nationwide promotions such as the coupon booklet, there are regularly in the app exclusive coupons. These are only available in the app and only for registered users. In order to be able to offer coupons to your liking and keep you up to date on new promotions, we need your registration. Why do not I still see coupons? If you have re-registered, it may take a few minutes to see your coupons. Please be patient for a moment. If you have already plastered all coupons, check back soon. There are regularly new great offers. * Promotional products are available in all participating restaurants in Germany and in Luxembourg. ** You get price information directly in the restaurant. 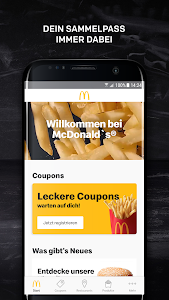 *** Coupons can be found in the app only for Germany-wide promotions and / or in the promotional period. The redemption is only possible in participating restaurants. 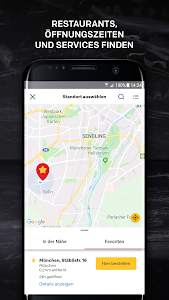 You can find the list of participating restaurants as well as all other redeeming conditions under the coupon details in the app. **** Mobile order and payment is currently only available in individual restaurants. 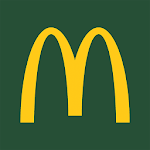 A list of participating restaurants can be found in the app. Mobile payment requires a valid VISA or Mastercard credit card. Ordering is only active if you are near a participating restaurant.